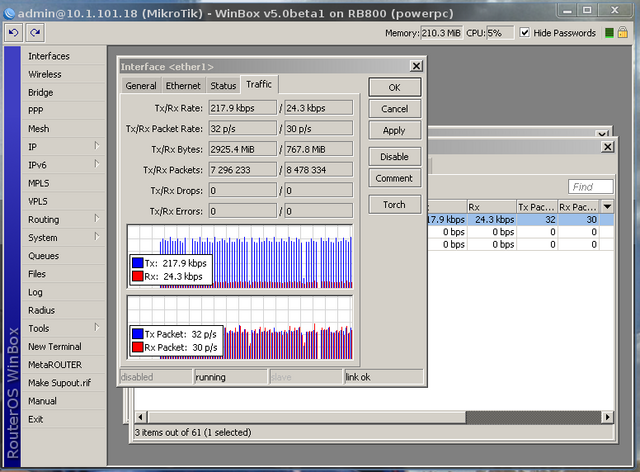 Winbox is a small utility that allows administration of Mikrotik RouterOS using a fast and simple GUI. It is a native Win32 binary, but can be run on Linux and Mac OSX using Wine. 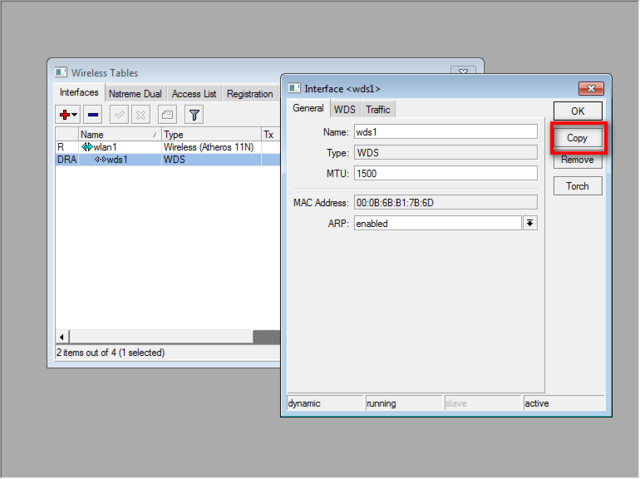 All Winbox interface functions are as close as possible to Console functions, that is why there are no Winbox sections in the manual. 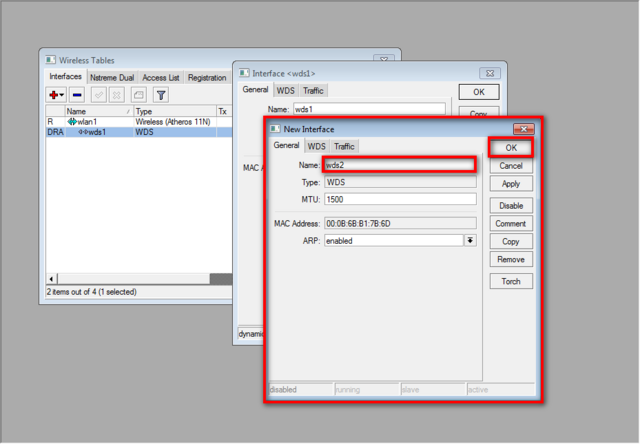 Some of advanced and system critical configurations are not possible from winbox, like MAC address change on an interface. 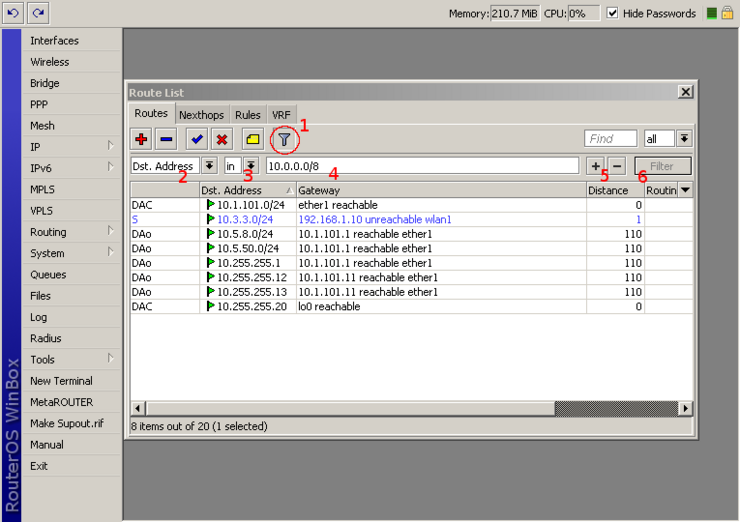 [...] - discovers and shows MNDP (MikroTik Neighbor Discovery Protocol) or CDP (Cisco Discovery Protocol) devices. Save - Save address, login, password and note. 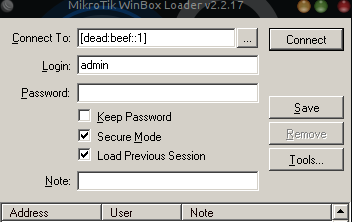 Saved entries are listed at the bottom of loader window. Tools... - Allows to run various tools: removes all items from the list, clears cache on the local disk, imports addresses from wbx file or exports them to wbx file. Load Previous Session - if checked, winbox will try to restore all previously opened windows. 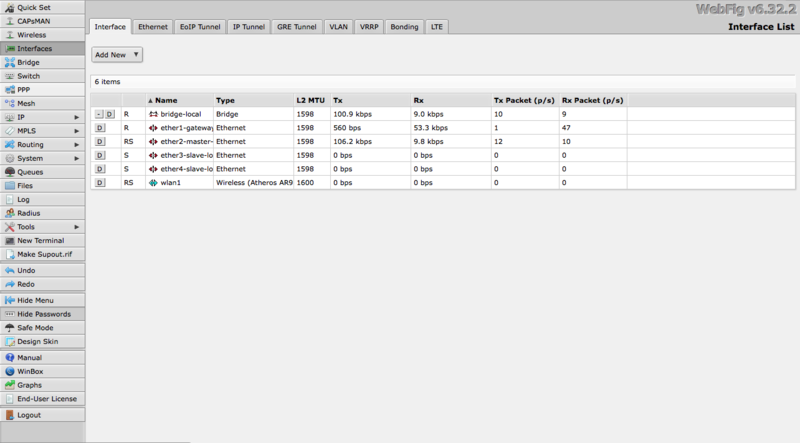 Note - description of the router that will be saved to the list. Warning: Passwords are saved in plain text. Anyone with access to your file system will be able to retrieve passwords. Will connect to router 10.5.101.1 with username "admin"without password. 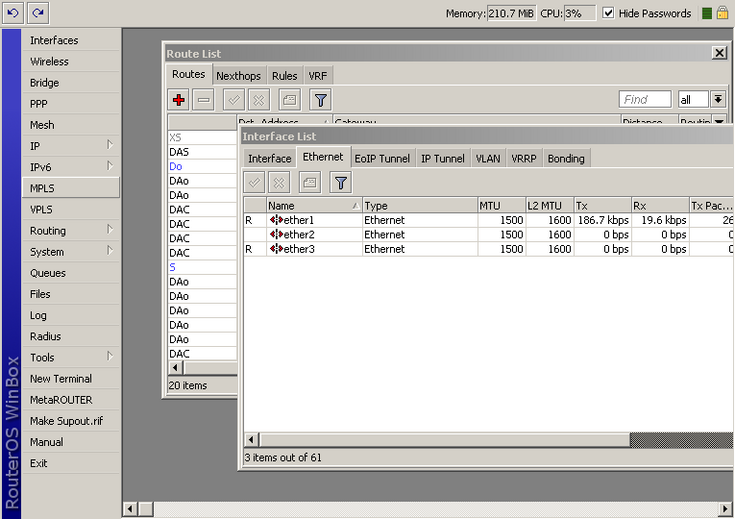 Main toolbar at the top where users ca add various info fields, like CPU and memory usage. 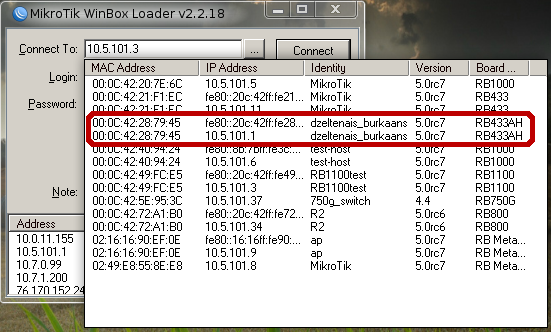 From screenshot above we can see that user admin is logged into router with IP address 10.1.101.18. 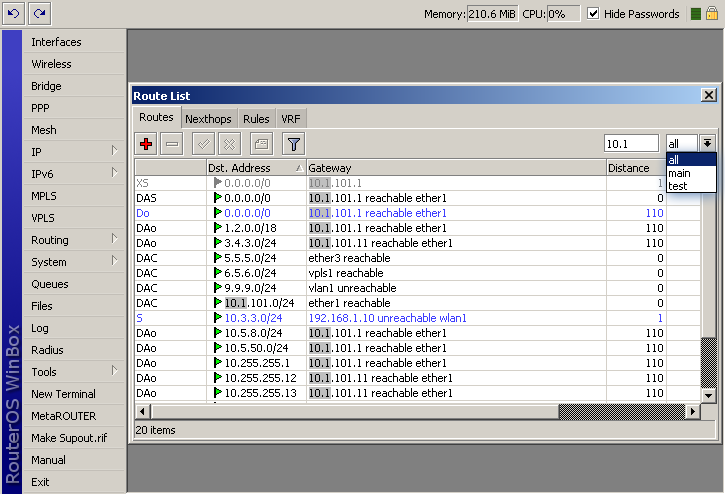 Router's ID is MikroTik, currently installed RouterOS version is v5.0beta1, RouterBoard is RB800 and platform is PowerPC. checkbox Hide password. This checkbox replaces all sensitive information (for example, ppp secret passwords) with '*' asterisk symbols. 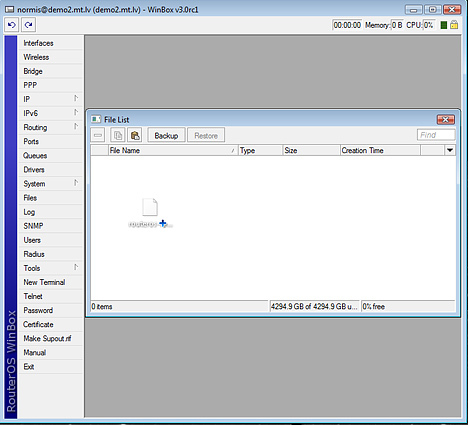 It is possible to upload and download files to/from router using winbox drag & drop functionality. 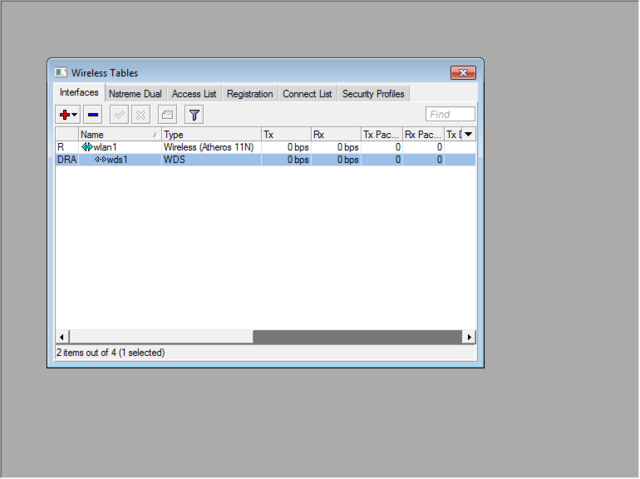 This shows how easy it is to copy an item in Winbox. 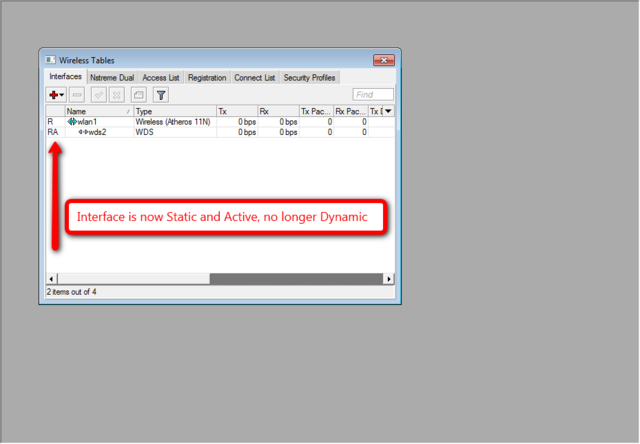 In this example, we will use the COPY button to make a Dynamic WDS interface into a Static interface. Simply copy this file to the same location on the new host. This page was last edited on 26 April 2016, at 10:22.